A few months back, I reviewed the first half of M3: The Dark Metal and was impressed at the mecha anime’s neverending conga line of despair. And if there is one major flaw in the second half of the series, it’s that the conga line did, in fact, end. The first half of M3 was set up pretty simply. There were the bad guys—the monsters from the Lightless Realm and Heito—and the good guys—the main cast of pilots and practically everyone else. In the second half of the anime, things become far more complicated and the line between hero and villain is far from clear. We see there are far more than two sides to the conflict—everyone has motives that define his or her actions. Because of this, there are no truly evil characters. Even the most horrible of the lot believe they are doing what is right—or at the very least, justified. This in turn makes the characters seem far more real as opposed to simple cliché archetypes. More than that, these characters are not static; each of the second half's remaining pilots change and grow. Akashi learns to let people in. Maamu learns she is not alone and becomes driven to step up alongside her friends. Iwato and Raika realize they are in love and struggle with the thought of which one of them will become the heart of the next robot and which the pilot when all they want is to be together. But by far the biggest character shift is Minashi's. Starting off as the peacemaker in the group, he takes the role of central villain by the end—determined to stop conflict and promote understanding by merging all life on earth into one being. And while this is an extreme change, it also makes complete sense based on the events of the series and how they personally relate to him. It is in the second half of M3 that the origin of the Lightless Realm and the connection between the pilots are revealed. The story is an interesting one—connecting the backstories of several characters in interesting ways and showing how adults pushing their need for revenge onto innocent children is never a good thing. So from a character standpoint, it works quite well. Where it doesn't work so well is in its sudden mixing of genre elements. Up until the reveal, M3 is very much a science fiction anime. However, then we learn that the creation of the Lightless Realm is basically due to an unknown creature, a magical rock, and a supernatural ritual—i.e., fantasy genre elements. Now this is not to say that a work can't mix sci-fi and fantasy elements—I mean, look at Star Wars. However, the abrupt change from a world of science to one of magic that late in the series does strain credibility quite a bit despite all the good that comes from it through character building. When it comes down to it, M3 is all about interpersonal connections. All the main characters are connected through past events, and each has at least one other member of the group he or she has a greater connection to than to the others. This is shown as a telepathic link—one that sometimes goes as far as speaking into another's mind. It is the whole basis for how the mecha in the series are able to work so well—one person is the pilot, the other is the mecha. But beyond that, the entire plot breaks down to the idea of people being unable to truly understand each other without a direct mind-to-mind connection. And as the various heroes and villains formulate different plans to overcome that problem, they come into conflict. Unfortunately, the problem is that this idea of connections is taken far too liberally by the end of the anime. 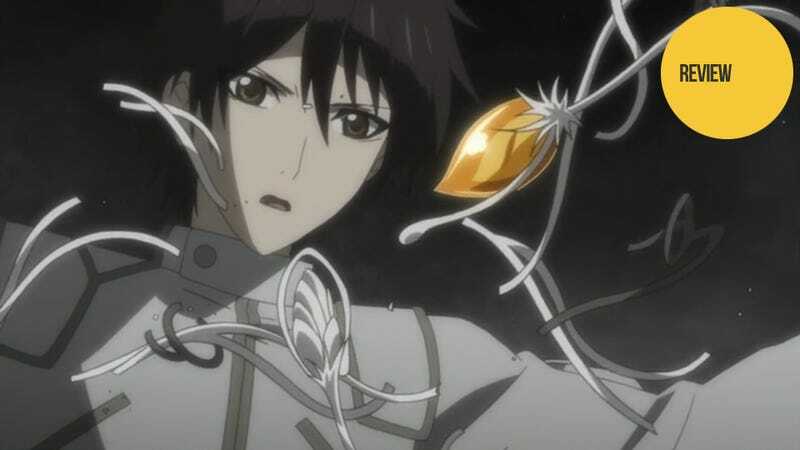 While connecting with a human integrated into a mecha or perhaps connecting with an AI makes sense, the final few episodes involve Akashi linking to a machine without a soul of any sort for no adequately explained reason. Like the sudden revelation of the magical origin, this seems so out of place with everything that came before that it stretches, if not breaks, the suspension of disbelief. Perhaps the aspect that made M3 so compelling initially was how dark its first half was—main characters dropped one after another in the most depressing of ways. Of course, the problem in an anime where main characters die (or rather enter into a fate arguably worse than death) is that when characters stop dying, it feels like the show has lost its teeth. From the midway point to the start of the final climax, not one of the remaining main characters dies. Sure, one of the villains and a person we already thought was dead don't make it; but the main characters are perfectly safe—even though the show constantly tries to make us think that either Iwato or Raika could die at any moment. The ending even goes a step further by undoing the majority of the series' “deaths” to provide an uncannily happy ending—making the most emotional moments of the anime feel false in retrospect. In the end, there are few lasting consequences for characters, undercutting much of what made the show interesting to begin with. The second half of M3 has some very strong points—namely the complex characters with their constant development and personal motivations. It also has some decidedly weak points—namely the fantasy twist and undercutting of the first half’s non-stop chain of despair. In the end, this makes the series feel rather mediocre overall. If you like mecha, emotionally depressing shows, and deep characters, I’d still give this one a recommendation. But if all three of those aren’t your cup of tea, it’s perfectly acceptable to let this one pass by. M3: The Dark Metal aired on Tokyo MX in Japan. It is currently available in the US for free and with English subtitles on Daisuki.